Skip the Sand Castles! 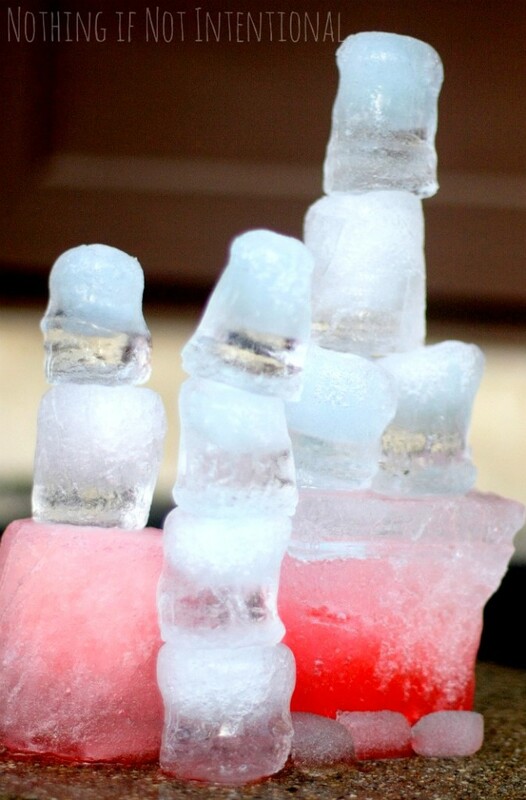 Try Making an Ice Palace. 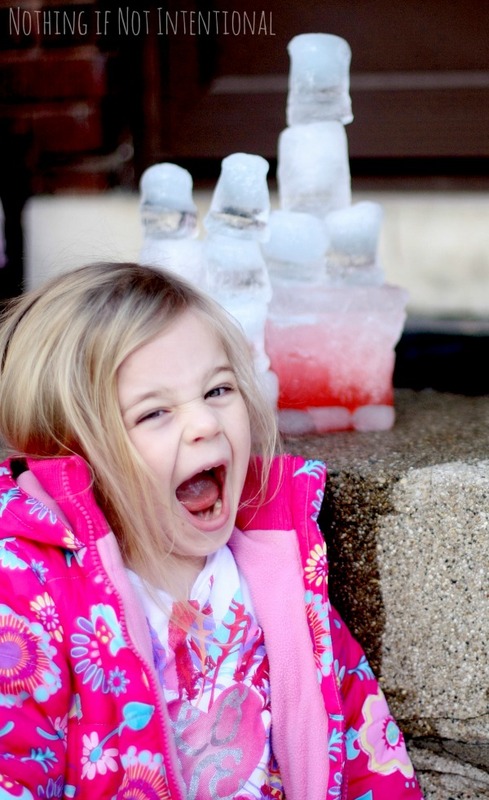 Whether you live by a beach and need a break from sand castles or if you’re shivering in sub-zero weather, an ice palace is a fun way for kiddos to create, build, and explore. Last week I jumped right back into blogging after the Puerto Rico drama thanks to my blogging friends and the fun we had with our Winter Play Days series. This week, however, I’ve been taking it easy. I thought I wasn’t going to post at all this week, but then this idea (which I originally intended to include in last week’s series) worked out! 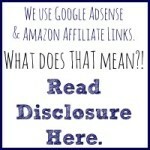 So why didn’t I share this last week? Well, because the first time we tried to make ice castles, it was a disaster. I had nothing to show for our efforts except for a couple chunks of colorful ice. But this time…it worked! Pretty, right? So what went wrong and what went right? Your recycling–yogurt, sour cream, cottage cheese, margarine tubs. 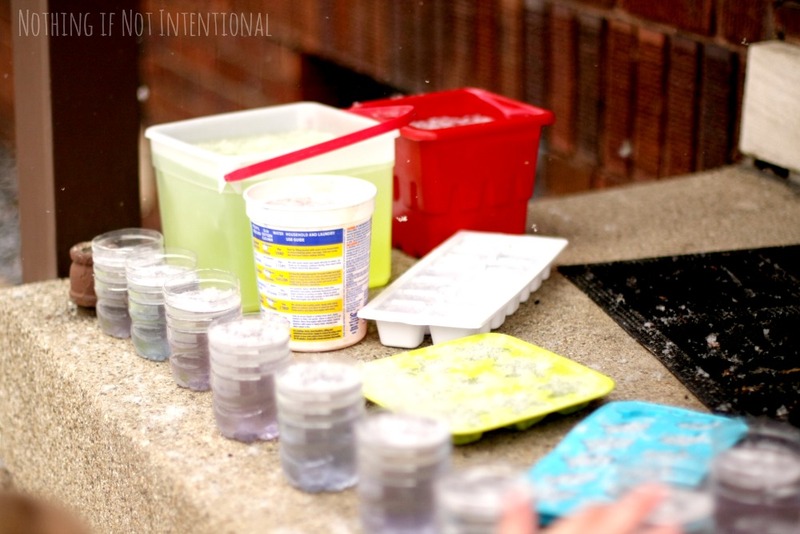 We filled these with water, added some neon food coloring, and put them outside to freeze. For my fair weather friends, use your freezer (or better yet–your deep freeze!) to make your castles. Your warm weather may prove to be an advantage–read on! It was well below freezing (about 17 degrees Fahrenheit), and I couldn’t get the pieces to come out of their containers! I knocked them and loosened them with a bit of water, but NO LUCK. Eventually the biggest chunk came crashing out of the ice cream tub…and shattered all over the sidewalk. Frustrated, I left the other buckets sitting on the porch and moved on. A few days later, the temperature started to push up into the 40s. This loosened the ice chunks and made them much more conducive to building. See that tongue out? She means business. We used salt to lower the ice’s melting point and to hold our pieces together. Ice castles make us silly/happy/crazy. If the temperature isn’t right outside, bring your ice inside and build in your sink or bathtub, on a cookie sheet, or on shower curtain liner or tablecloth. 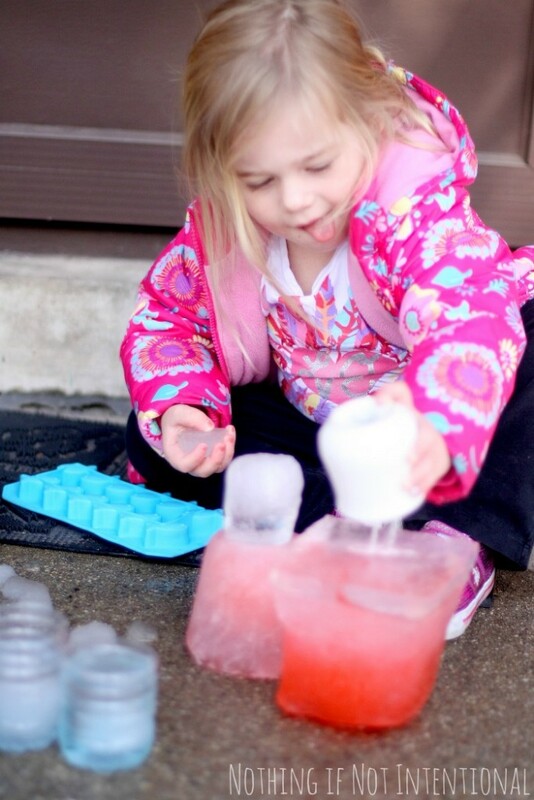 When you’re done with your ice palace, knock it down and try the little ice melting experiments we did in this preschool winter science post. Thanks for visiting and for sticking with me to the end! I’d love for you to hang around! 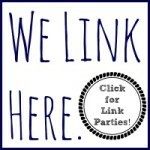 Why not join the conversation on the Nothing if Not Intentional facebook page, pin with us on pinterest, or hang out with us on Google plus?